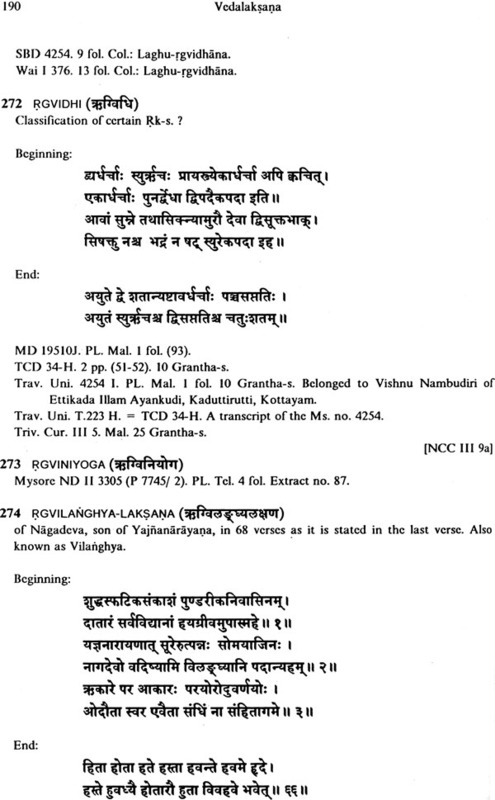 The group of ancillary 'Vedic" texts, in (South) India traditionally referred to by the term Veda- Laksana, was given the attention due to it both by scholars in India and the West from the middle of the l9th century until approximately the first half of our century. To be sure, the study of Vedic texts in the strict sense, i.e. of those of a non-ancillary character, can he said no longer to form the centre and main focus of lndology. 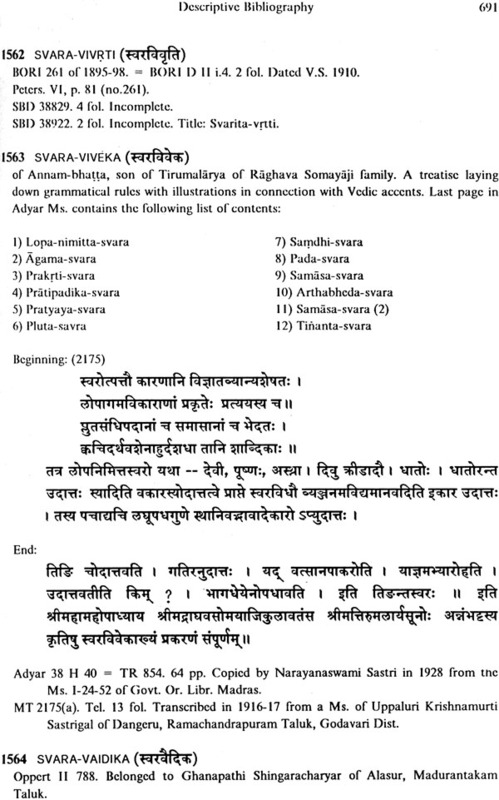 But the situation is much worse in the case of the Veda- Laksana part of Sanskrit literature: they have been virtually forgotten since about 40 years. This is hardly the occasion for analyzing the reasons for this change, but rather for emphasizing its highly problematic, nay in fact deplorable character. 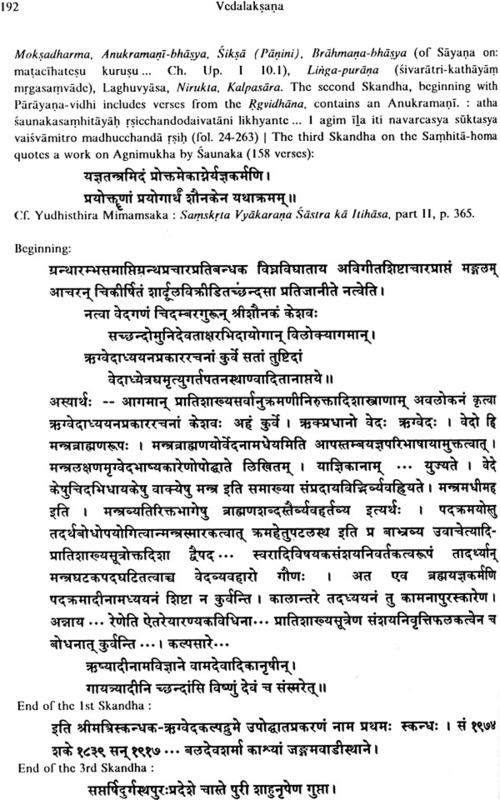 In my view it is sufficient to just glance through the present "(Catalogue", and read some of the entries more carefully, in order to immediately realize that these texts — and not only the better known class of Pratisakhyas, Siksas and Anukramanis, but also the works on accentuation, on different forms of modified recitation and the various kinds of lists of special Vedic words are spite of their apparently highly technical and scholastic nature of extraordinary general ideological importance; l should even say: they are simply fascinating, for a number of reasons, most of which have already been pointed out by Pandit Aithal him self in his "introduction". Oral transmission has played an enormous role in India, and has deeply formed her culture until the present day; but it is in lndia, too, that in addition to and side by side with texts which have been transmitted in this manner (even after writing came into use) we find a great number of texts which allow us to look behind the curtain and to study the various mnemonics, the techniques and methods developed for the sake of preserving orally transmitted texts; again, this type of material is extremely valuable also as evidence for the process which led to the formation of certain sciences, e.g. phonetics, grammar and lexicography, on the basis of an already established, richly developed tradition of passing on orally fixed (religious and sacred) knowledge from nee generation to another. 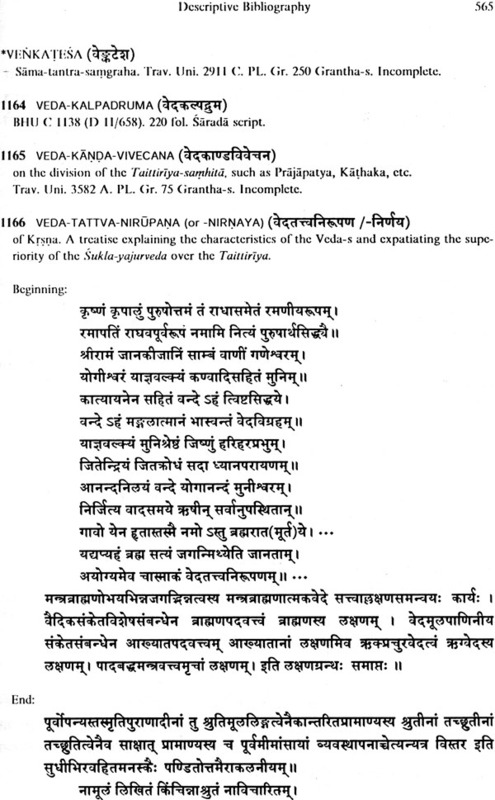 It would, however, be wrong to believe that the Veda-Laksana texts are of relevance only to the various aspects of the historical process of the transmission of the Veda through the ages and of the technique of this transmission; for they can certainly also render assistance in reaching a better understanding of the Veda it self as has been shown most convincingly by G. Cardona in a recent article on the accentuation of the Sazuparhuhrdhmugm : with the help of the Bhésikasiitra (on which sec below pp.463-67) and similar texts he has, following F. Kiclhom, definitively solved the much discussed problem of the nature and marking of the accent in this Brahmana. I do not, of course, want to suggest that what is said in these texts can and should be blindly accepted by Vedic scholars; the critical attitude which lndologists have learned to adopt towards them is certainly not to be simply thrown overboard. But, to be sure, these texts are also not to be pushed aside as being by their very nature of, if at all, secondary importance only. They fully deserve the philologists', especially of course the Vedologists', attention, but equally as historical documents in their own right. Pandit Aithal has to his credit not only that he has reminded us of the multifaceted importance of the Veda- Laksana texts. He has done much more, viz. 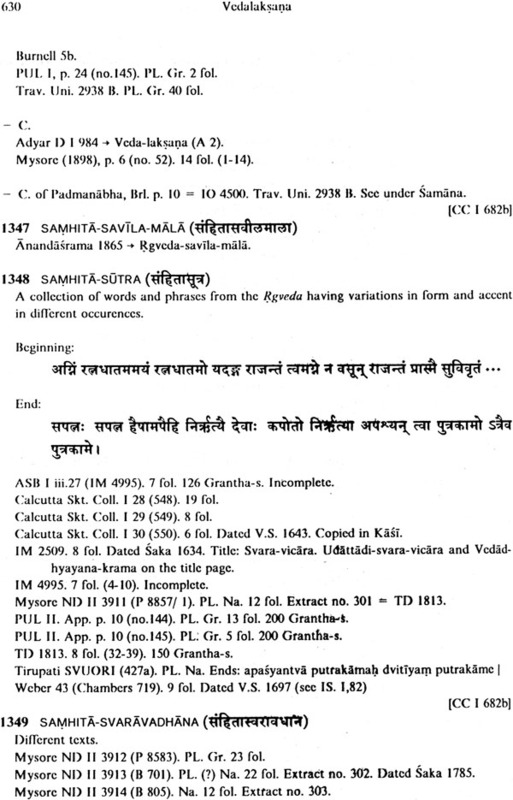 given us an excellent tool for research which proves to be a most reliable source of information on the available manuscripts, the existing editions and the published literature on them, and it is a tool which designedly and most efficiently paves the way for what may well lead to something like a renaissance in studies in this branch of Sanskrit literature. I for one join Pandit Aithal in hoping that his "Catalogue" will not remain a mere documentation of the work done by former generations, from Saunaka down to e.g. Devasthali and from Pertseh down to e.g. 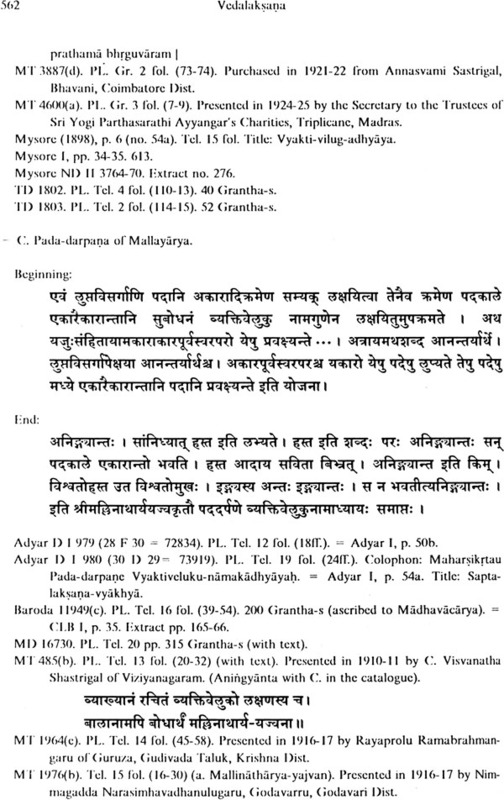 Cardona, but that it will fulfill its true purpose as a. mighty incentive to resume the editorial and similar scholarly activities in this highly interesting field of traditional Indian learning: after all there still are some pandits who have full command over this kind of texts, the tradition of oral transmission is not yet entirely extinct. It would, I feel, be a tragedy, if now that lndologists have finally realized the importance of the living oral tradition of Vedic literature - all editions are, as well known, based on written sources only — our last chance of profiting from what has survived of a once vast world of living learning and edition were to pass unheeded; and, to be sure, the task of preparing critical editions of these texts, irrespective of whether they have already been published or not, and of studying their contents would be palpably facilitated by the cooperation of traditional specialists. 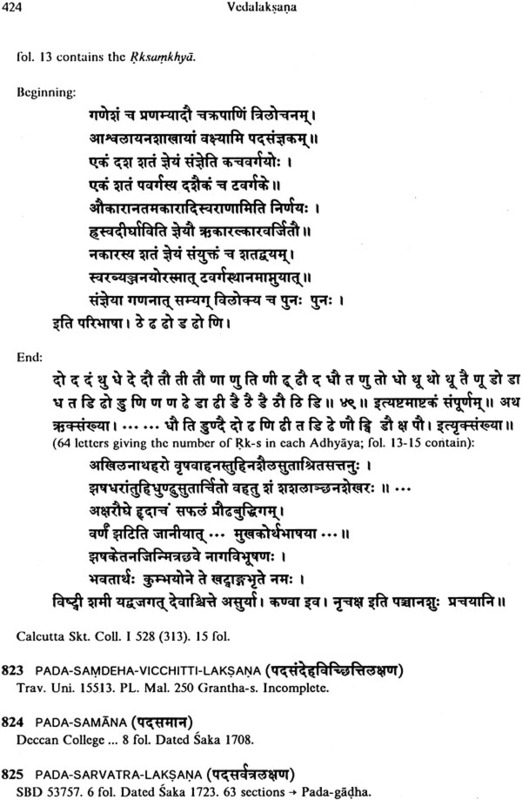 No one who has ever himself` done similar exploratory work in a manuscript library needs to be told that Pandit Aithal has suffered quite some privations in the course of the last years — a fact which he himself does not mention, thus displaying that unassumingness which together with his other outstanding virtues is the mark of a true Brahmin. The thanks we, his fellow lndologists, owe him we should give to him by directly or indirectly supporting and furthering his noble aim which will ultimately enable us to comprehensively evaluate the Veda—Laksana texts also in terms of their more general contribution to Indian culture and Indian History of ideas. 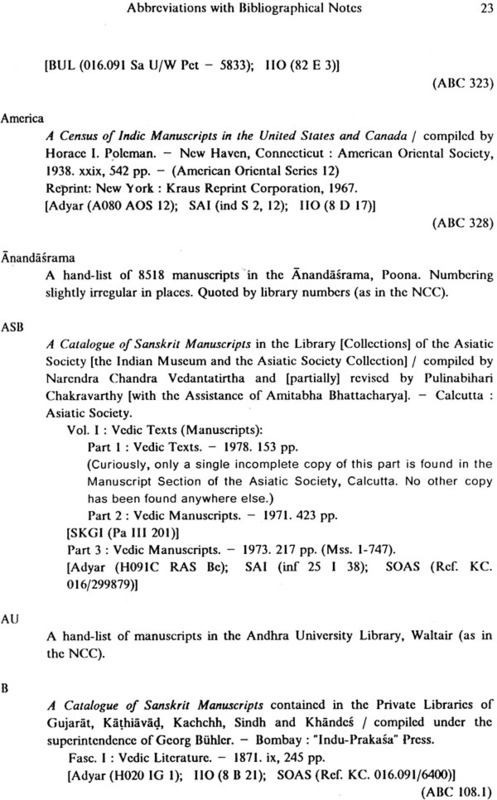 The aim of this bibliography is to compile a comprehensive list of all Vedic ancillary watts known so lair through printed editions, manuscript catalogues of libraries and references in literature. 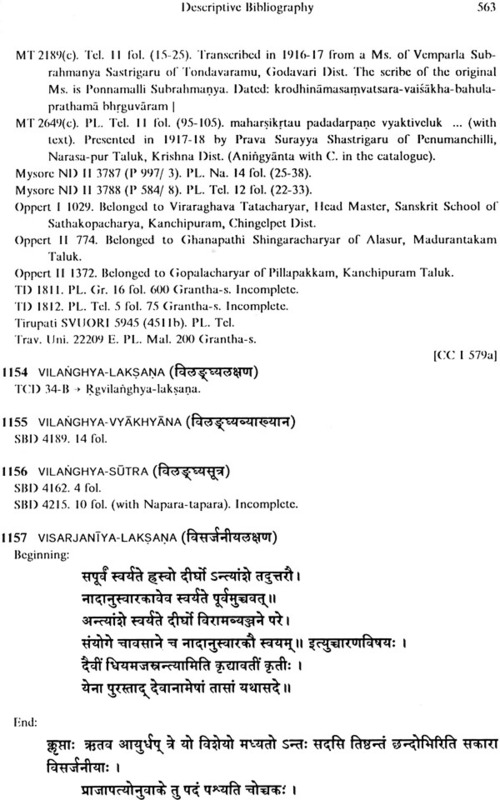 These texts are known as "Laksana-grantha-s. Since they define the characteristics and- describe the special features of Vedic texts, they are generally termed "Veda-laksana. 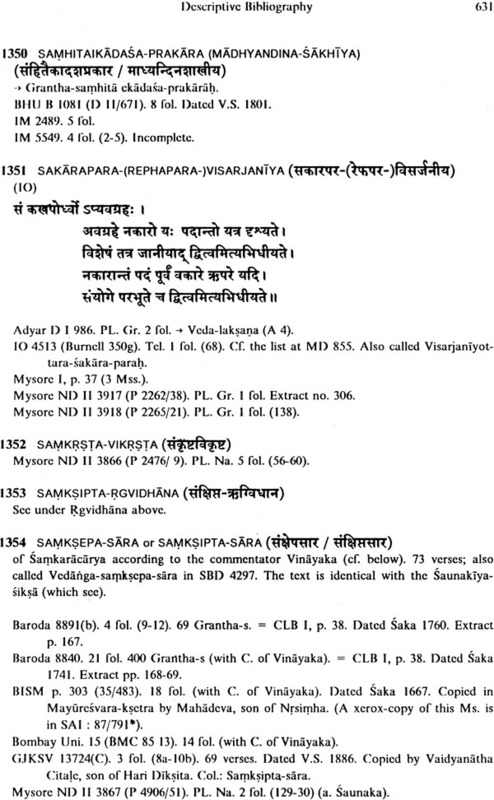 These texts are of ancillary nature and generally classified under Vedanga, though only a few of them belong to the proper Vedanga known as the Siksa-s. 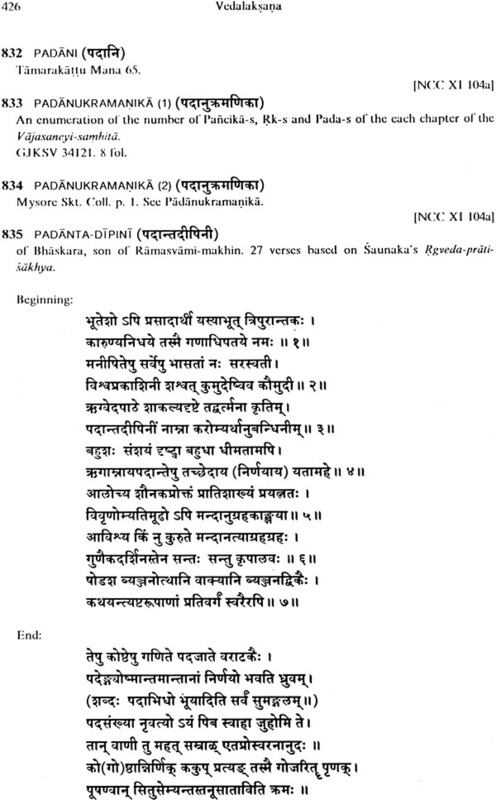 They include Pratisakhya-s Anukramani-s, works on accentuation (svara) and on different forms of modified recitation (vikrli), and various kinds of indexes. lt is generally not realized that these texts contain an abundance of valuable material for Vedic text—critical studies. 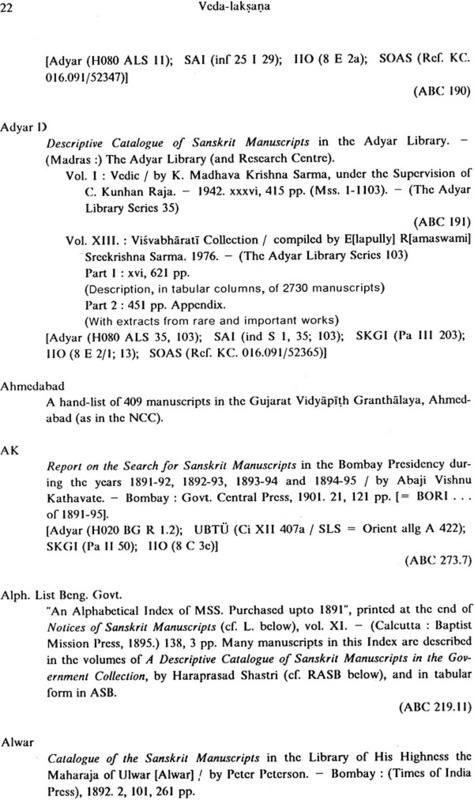 The idea of compiling this descriptive bibliography arose as a reaction to the difficult one encounter in obtaining details on manuscripts of Sanskrit texts. 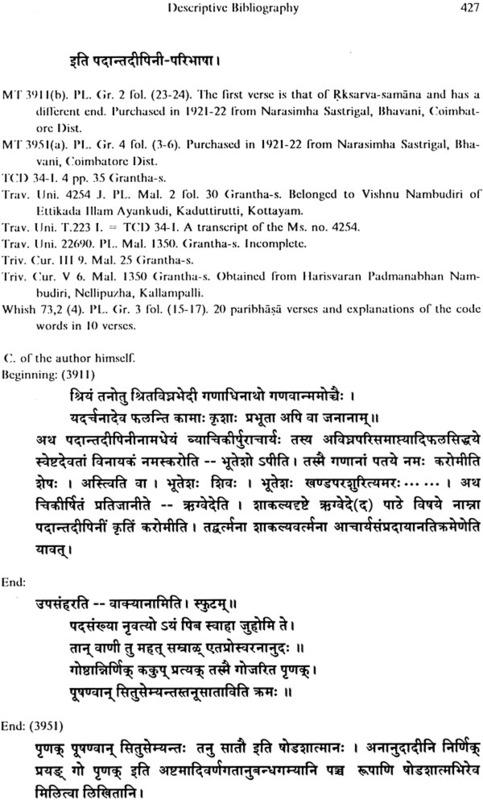 Those who have attempted to edit a Sanskrit text from original manuscripts know how difficult it is In get reliable information about the existence of and access to manuscript material; Manuscript catalogues that contain relevant information are available only in specialized libraries, and not even in the catalogues can one find all the information one is looking for. 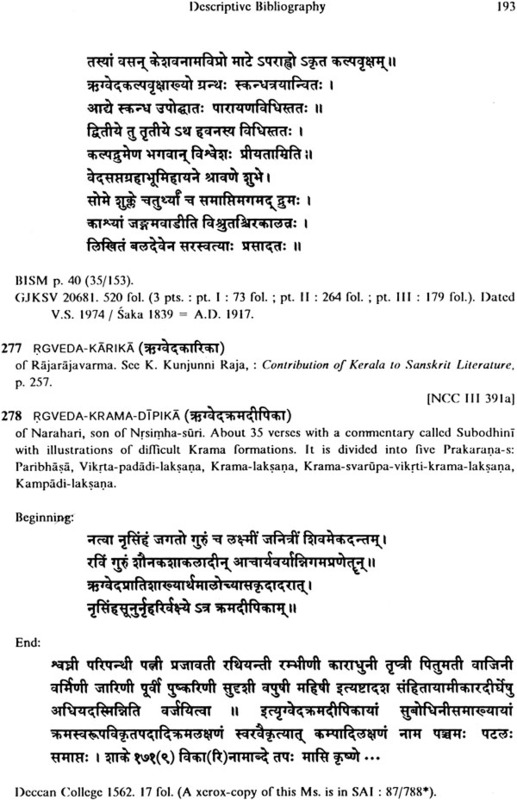 Literary manuals generally tend to neglect the Veda-laksanaa works. 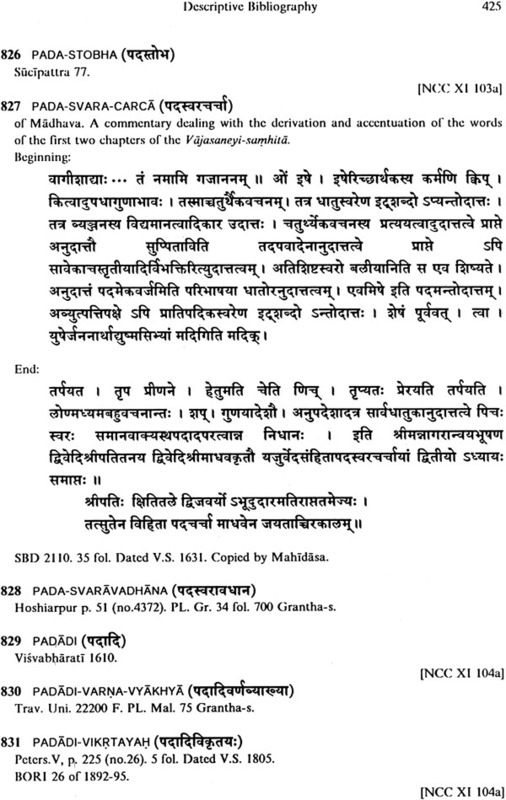 Histories of literature, even the most recent ones, make only passing remarks on Veda—lak.yagza wor or confine themselves to dealing with well-known texts such as Pratisakhya-s and Siksa-s in general. It is indeed striking that these texts seem to have failed to attract the attention of scholars in modern Vedic research. Such texts are not only interest it from the point of view of the preservation of Vedic texts, but are also very instruction for an understanding of the various devices or methods of learning that were exclusively developed for this purpose. Moreover, they can help us to understand the various aspects ofthe history of the transmission of Vedic texts. It is well known that most Vedic texts have been transmitted orally — from teacher to pupil ~ from early times to the present day. In spite of the fact that innumerable manuscripts of these sacred texts have existed for centuries and that printed books available since the middle of the last century, only the oral tradition is recognized authentic and authoritative. During Vedic rituals printed books, manuscripts or writ notes are not allowed to be used. Even when one is reciting for ritual purposes, tradition generally does not permit the use of written material? This would divert the attention from the ritual act. Usually entire texts are learnt by heart before they are recited for ritual application. For the purpose of easy learning and memorization as well as preservation of the sacred texts, tradition has evolved some peculiar but very useful devices which have been applied from time immemorial, and even now practised in the traditional system of education. These devices help the students to learn and memorize entire texts — even large texts like the Rgveda~ with utmost accuracy. "‘ This methodological and didactic aspect of Vedic and ritual text tradition has not yet been thoroughly and sys- thematically investigated in modern Vedic scholarship. 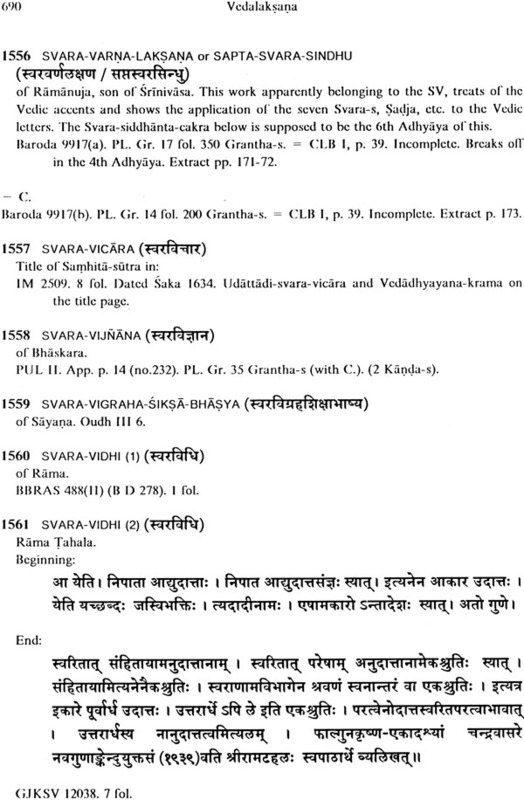 For the documentation of materials which constitute the theoretical basis of the method of traditional Vedic learning, my modest attempt has been list of all to pre- pare a consolidated list of all the works known so far, with a brief description of the contents of those works. l have also indicated the availability of the manuscript material in order to facilitate the editing and publishing of some of the important texts. The preliminary list, which I have prepared mainly on the basis of the New Catalogues Catalog rum, Aufrecht's Catalogues Catalog rum, and other manuscript catalogues, contains over 1600 titles. The titles pertaining to the Rgvedie School alone run up to three hundred. During my visits to different manuscript libraries in India and Europe l have collected number of manuscripts, or procured transcripts or microfilms of several minor works that are used by recites. There are hundreds of such manuscripts in private possession and hundreds more in various manuscript libraries in India and abroad. In the Adyar Library and Research Centre (Madras), where I worked from 1962 to 1970, there are over 500 such manuscripts." 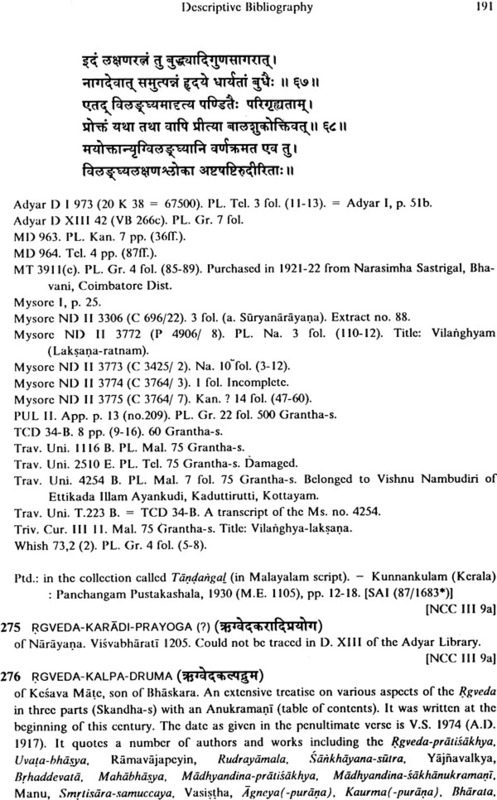 In the Oriental Research Institute, Mysore, there are more than 600 manuscripts." 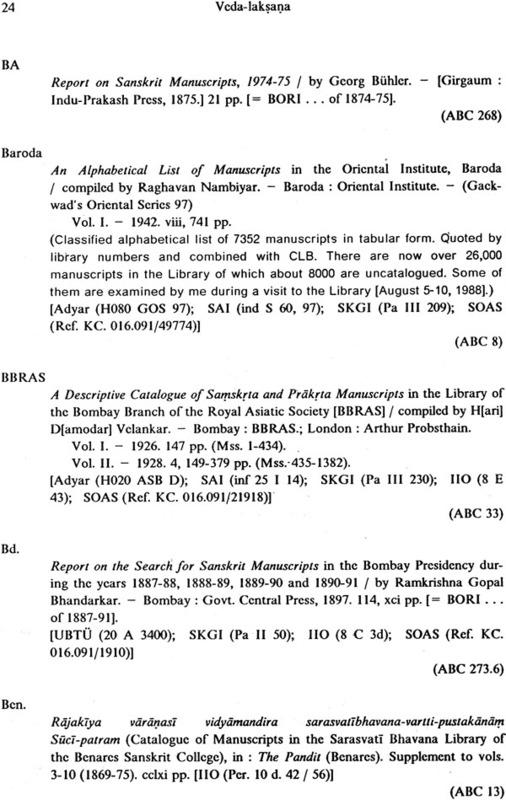 The case is similar with other manuscript libraries. As i have already noted, publications on these works are very rare and only a few texts are available in print. The present volume is an annotated bibliography of the Vedic - laksana, the existence of which could be determined on the basis of printed editions, catalogues of manuscripts, and citations in other texts. 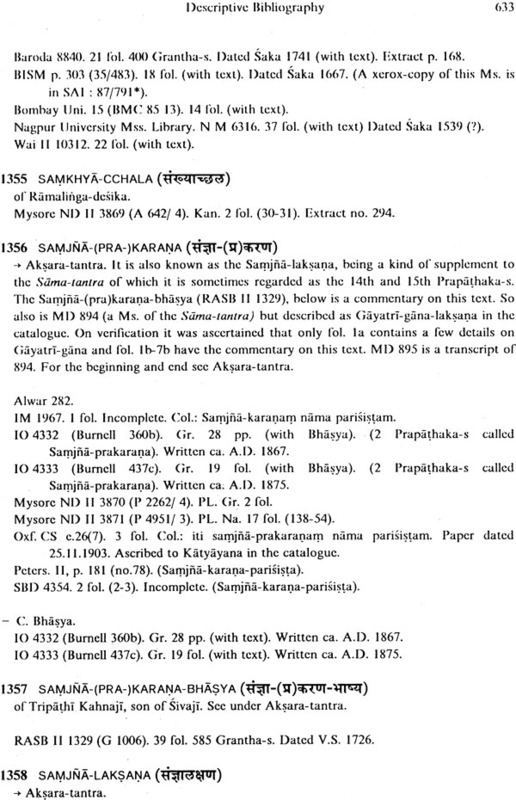 The incentive for compiling this bibliography grew out of an awareness that hardly any reliable information exists concerning manuscripts of Veda - laksana texts, although they are of great use in text critical studies of Vedic texts. 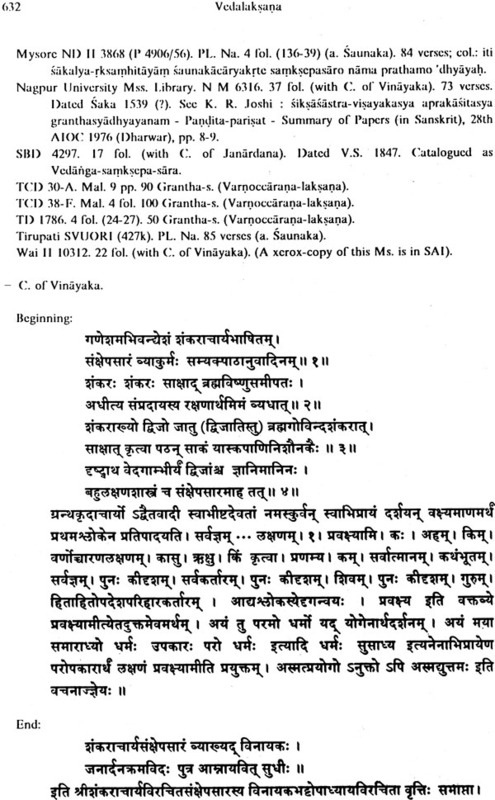 The goal of this work is to provide a comprehensive handbook of source materials on Veda- laksana by identifying and distinguishing the texts in various manuscripts and printed editions according to their contents and actual titles. Generally, the content of each text is described in brief. In order to simplify the identification of texts with different titles and different texts with identical titles, the beginning and end of a given text is appended. This is the case especially for texts that remain unpublished. 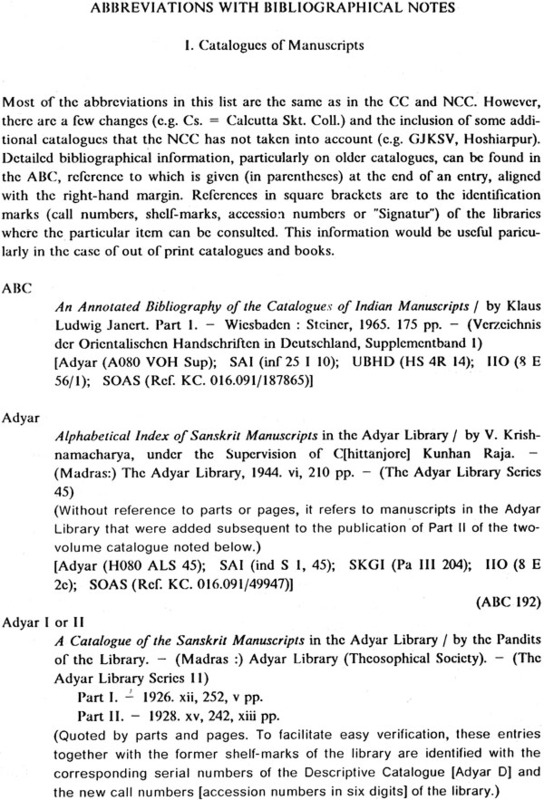 Then follow the call numbers and descriptions of manuscripts that are in pubic libraries in India, Europe, and the USA. For each entry concise information is given on the available manuscripts and the extant editions. Wherever possible, references to relevant secondary literature are provided. In several cases the present condition of the manuscripts concerned has also been indicated. The author has fashioned this comprehensive bibliography both with the clarity expected of an experienced manuscript specialist and the sensitivity expected of a teacher of Brahmanical tradition. The publication of this volume is informed by the hope that the critical study of Vedic literature will thus receive new impetus. K. Parameswara Aithal is one of the few contemporary scholars who combine the deep knowledge of a traditional pandit with the analytical methodology of an Indologist. This rare fusion of different views of and approaches to Sanskrit texts has given a unique character to the author's catalogues and numerous other publications for more than three decades. Before joining the South Asia Institute of Heidelberg University in 1970, he had been the curator of the manuscripts section of the Adyar Library (Madras). Since 1988, he has worked together with other manuscript specialists on a descriptive catalogue of the Chandra Shum Shere collection of Sanskrit manuscripts at the Bodleian Library of Oxford University. In this connection, Dr. Aithal became a research fellow of Wolfson College of Oxford University in 1989. 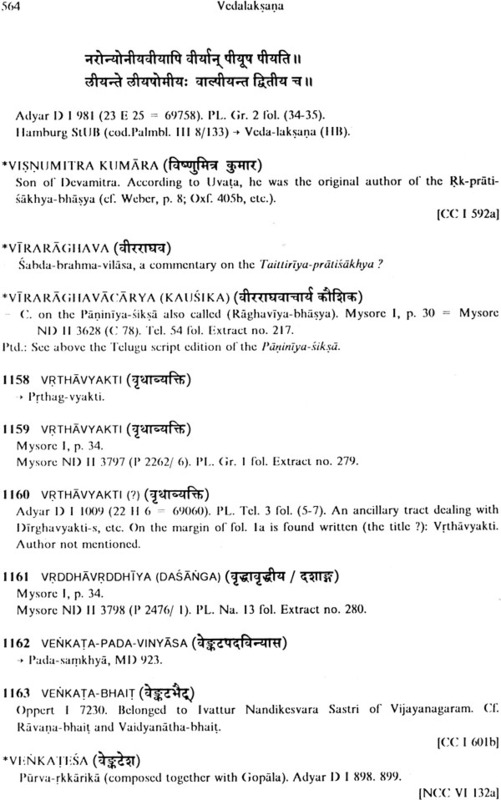 The present volume contains brief descriptions of nearly 1600 works of Veda-laksana. In compiling this bibliography the author visited more than 35 manuscript libraries in India and Europe and examined the manuscripts of unpublished texts. 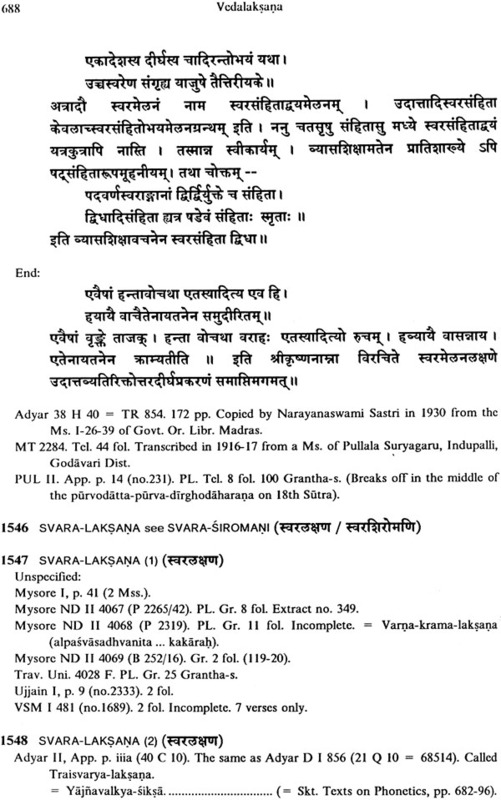 At present, Dr. Aithal is preparing a collection of Veda-laksana texts for future publication. I got my two dupattas today and I'm SO HAPPY! Books received in good condition and delivery was very fast. A great 'Dorje' has arrived. Thank you for your sincerity. Thank you for your amazing customer service! I ordered Liberating Isolation Sunday, March 24 and received it Friday, March 29! Much sooner than expected:)  The book was packaged nicely and is in great shape! Thank you again! Om Shanti Shanti Shanti !!! Exotic India Thank You Thank You Thank You !! !